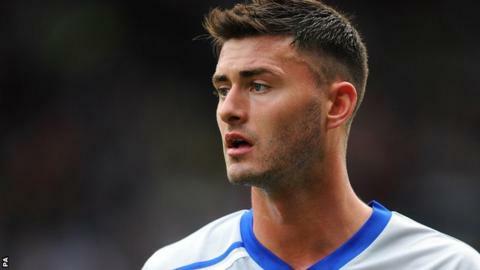 Gary Madine boosted Carlisle United's hopes of staying up with the only goal of the game against Swindon Town. Madine's early header forced a save out of Swindon keeper Wes Foderingham but he struck minutes later, converting Brad Potts's cross. "We were perfect from back to front but we didn't threaten the goal. "The second-half I thought we played well, we had a lot of possession, we had them camped in for long periods. "We had chances at the start of the second half that need to go in. "We've got to keep going, we can't change it too much." Match ends, Carlisle United 1, Swindon Town 0. Second Half ends, Carlisle United 1, Swindon Town 0. Second yellow card to James Berrett (Carlisle United). Yaser Kasim (Swindon Town) wins a free kick on the left wing. Gary Madine (Carlisle United) wins a free kick on the left wing. Foul by Troy Archibald-Henville (Swindon Town). Pascal Chimbonda (Carlisle United) wins a free kick on the left wing. James McEveley (Swindon Town) is shown the yellow card. Foul by James McEveley (Swindon Town). Attempt missed. Louis Thompson (Swindon Town) right footed shot from outside the box is close, but misses the top right corner. Corner, Swindon Town. Conceded by Paul Thirlwell. Attempt missed. Nathan Byrne (Swindon Town) right footed shot from outside the box is high and wide to the right. Attempt missed. David Symington (Carlisle United) right footed shot from outside the box is too high from a direct free kick. Corner, Swindon Town. Conceded by Reece Brown. Corner, Carlisle United. Conceded by Jack Stephens. Corner, Carlisle United. Conceded by Nathan Byrne. James Berrett (Carlisle United) wins a free kick in the attacking half. Substitution, Swindon Town. Louis Thompson replaces Massimo Luongo. Foul by Alex Smith (Swindon Town). David Symington (Carlisle United) wins a free kick on the right wing. Corner, Swindon Town. Conceded by Brad Potts. Substitution, Swindon Town. Nathan Byrne replaces Nathan Thompson. Corner, Swindon Town. Conceded by David Symington. Substitution, Carlisle United. Reece Brown replaces Daniel Redmond. Corner, Swindon Town. Conceded by James Berrett. Attempt saved. Troy Archibald-Henville (Swindon Town) header from the centre of the box is saved in the top centre of the goal.